A wet bag has a thousand uses! Okay, I'm not going to list all of them but I do use my DIY waterproof bags for dirty diapers, dirty clothes with spills on them and wet beach clothes. I keep one tucked in my diaper bag when I go out and it comes in handy. Often. Even if you don't use cloth diapers you will still use one! You can keep a clean change of clothes inside of one, ready to be swapped out if your baby spills, spits up or has a poop explosion down to her toes. Take out the clean clothes and put the dirty ones inside...all zipped up nicely, protecting all the other stuff in your bag. Wet bags are also fantastic when it comes to beach and pool trips! Toss in the wet swimsuit and all the other stuff in your bag stays dry. These are much prettier than a plastic bag, re-usable and washable too. Waterproof Material - This can be PUL fabric (which is usually polyester fabric that is coated with plastic on one side) or vinyl. You can also use felted wool if you are wanting go to the all-natural route. Keep in mind that wool isn't waterproof, it will only absorb moisture but works fine for spills and beach clothes. Outer Fabric (optional) - I never like the PUL fabric selection at my local fabric store, so I just buy the white stuff and then have an outer layer of pretty fabric. Zipper - Length depends on the size of your bag. Yes, zippers can leak, but as long as you do not put cups and cups of water inside (why would you...) it should be fine. I've never had a problem with zippers. Some people just use drawstring closures. 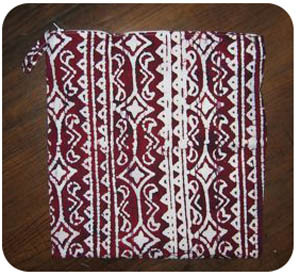 Cut a rectangle of fabric and simply fold it to create the bottom. 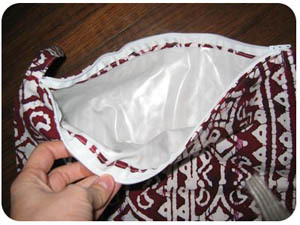 Put the shiny side of your PUL fabric on the inside of your bag, facing the contents. 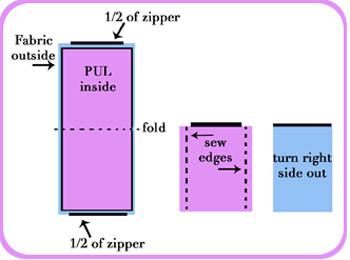 Sew on your zipper, sew up the side seams and then turn right side out. That is it! Now get yourself to the beach or pool and put it to good use. Back to the top of the Wet Bag Pattern page.